Valentine's Day has always been one of my favorite holidays. It's not about the grand gestures for me; I love that even a simple card to tell someone you're thinking about them can make someone smile. Spreading love to one another is always beautiful. This year, Valentine's Day is on a Tuesday. Crammed right in the middle of the work week, I know that if I don't plan ahead, it might slip by, unnoticed since we all know how busy life gets. Last weekend, I downloaded this fun shopping list from American Greetings. 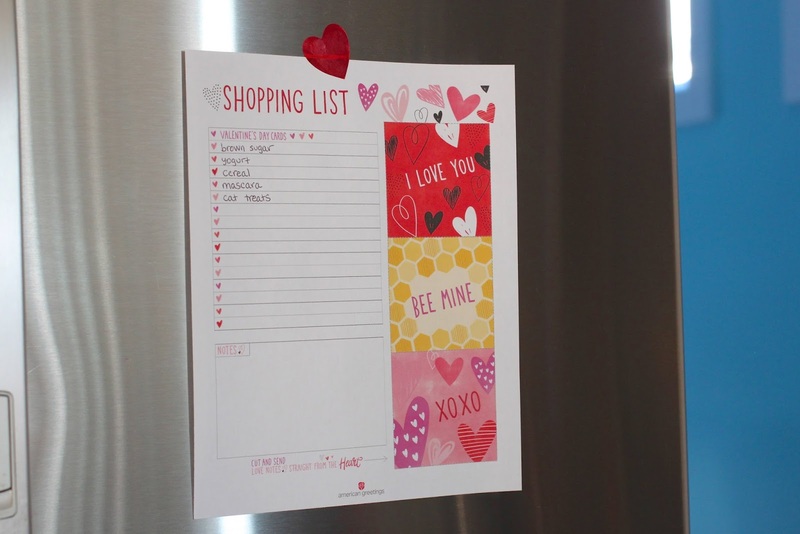 You can find tons of fun Valentine's-inspired ideas on the American Greetings website. Since buying cards was listed right at the top, I actually already purchased my American Greetings Valentine's Day cards! While I was at the store purchasing cards, I also picked up American Greetings stickers and tissue paper right in the same aisle as the greeting cards. 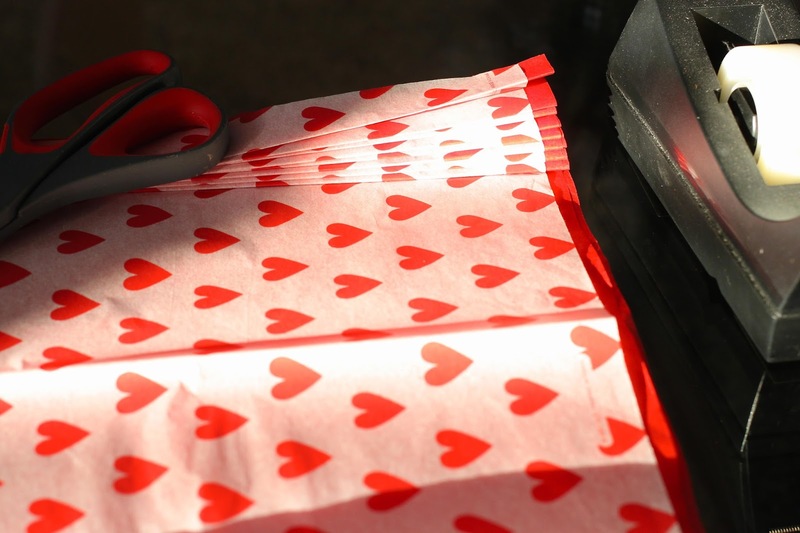 American Greetings works to make the world a more thoughtful and caring place every single day. 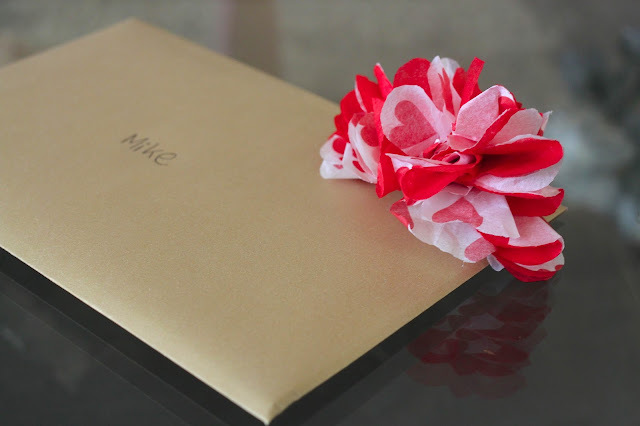 To decorate all of my cards, I love making these fun tissue paper pom-poms! 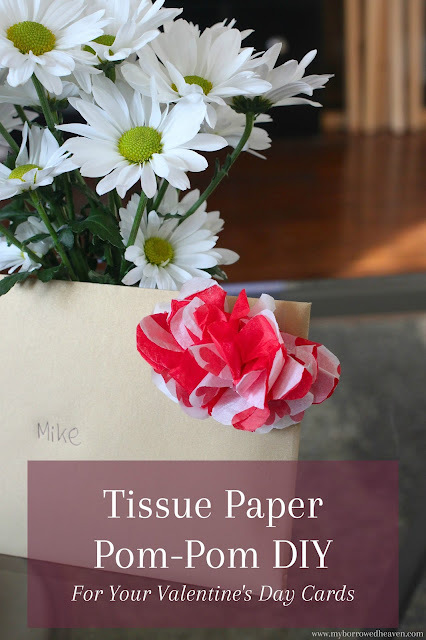 All you need to make four flowers are: two colors of tissue paper, cellophane tape, and scissors. 1. 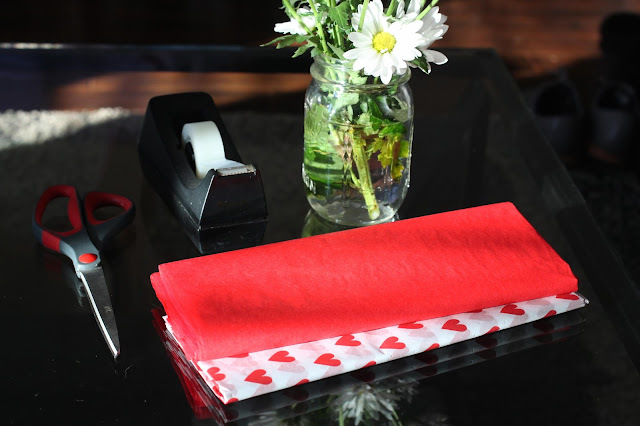 Fold, in half, two pieces of tissue paper (one of each color), and place one inside the other. 2. Accordion fold the two pieces of tissue paper, and tape the middle together. 3. 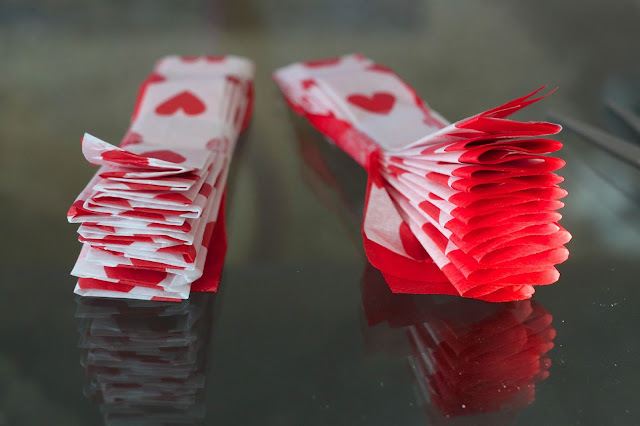 Cut once along the tape so you have two even accordions; then again so you have four. 4. 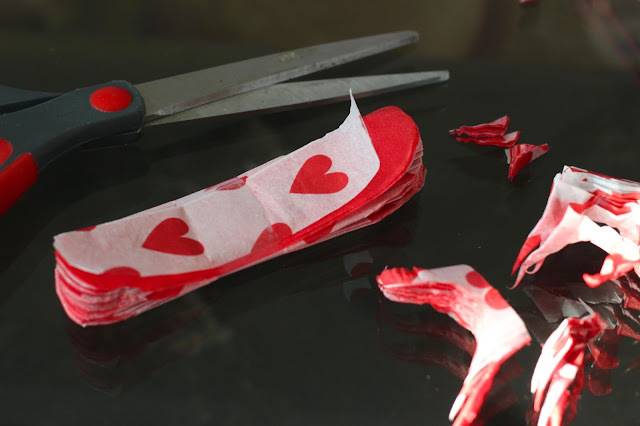 Round the untaped edges of the tissue paper with your scissors. 5. 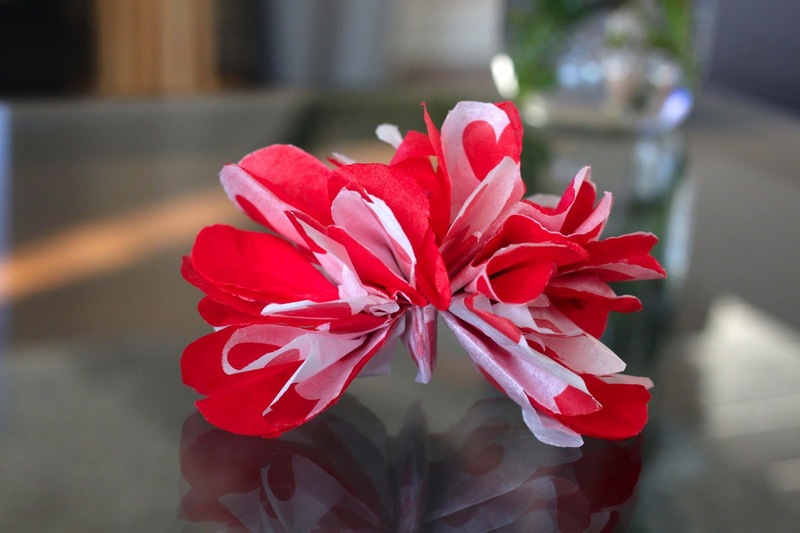 Fluff and unfold the accordioned tissue paper to make a round flower. 6. Tape the flower to the front of your Valentine's Day greeting card. My number one Valentine, for the seventh year, is my guy, Mike. He knows how much I love and appreciate him, and I am so happy that I found the perfect card to tell him so many of those things. Of course, I am working on writing my own personal note to him (part of the reason I bought the cards so early... 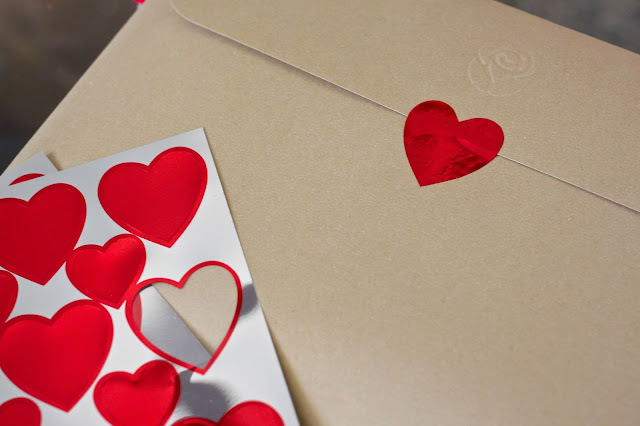 I like to get my thoughts down just right), but when you start with a card so perfectly matched to a person, it makes the words flow so much better. 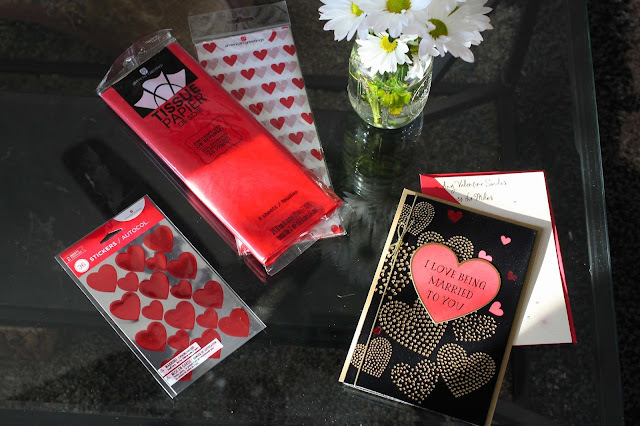 My Valentine's Day will be organized and thoughtful, thanks to American Greetings. Not only is Mike's card purchased, but also cards to send to family far away: Grandma, parents, and goddaughters. 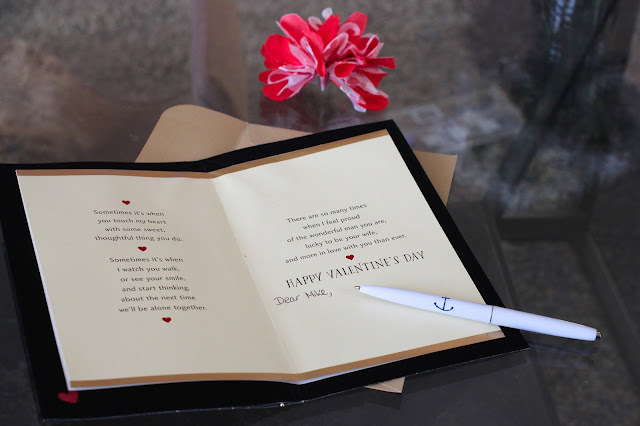 Each had their own personalized cards from American Greetings; their selection is fantastic! You can find your closest American Greetings retailer by clicking here. What are your Valentine's Day plans this year? How cute is that? I love little special touches like that. I might adapt your tissue paper flowers for a superbowl party. You made it look easy! These are the cutest! What a fun idea- thanks for sharing! Oh how cute! They are so simple to make. I love it. I love all your ideas for adding extra V-Day cheer into your day!! Those pom-poms are too cute! They turned out great! Love the Vday inspiration! My mom makes these tissue pom poms for so many events...I need to tell her to do some for Vday now too. So cute! Those poms are SO cute!! Valentine's Day is Jared's birthday so we'll be spending the day celebrating both! Really cute idea to decorate Valentine's gift or maybe even for a baby shower! This is so cute!! I always buy these from the store and put them together but this is so much easier since I have a ton of tissue left over! Thanks for the tutorial!